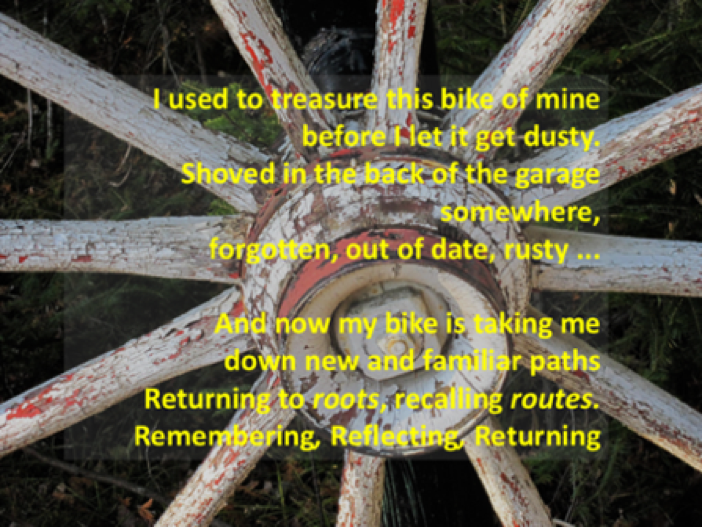 Our composition brings together poetry, music, images and personal narratives based around the experiences of an occupational therapist, Karen, who following a family career break, returned to her profession. 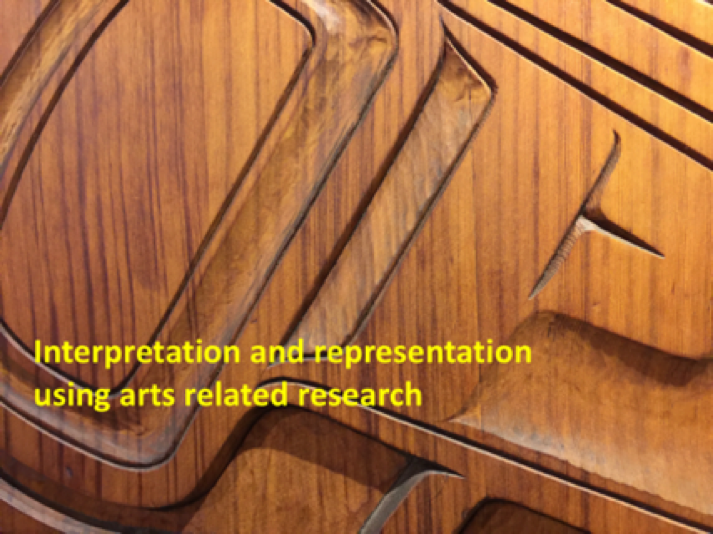 Our work demonstrates collaborative research practices and illuminates our experiences and journeying as practitioner-artists/researchers/teachers. This autoethnographic inquiry employs bricolage, drawing on theory and hybridized methods, inspired by the notion of ‘returning to practice’. The conversations of Karen and Katherine (mentee and mentor) as qualitative data, analyzed, interpreted and made accessible through poetry and images – along with Peter’s musical and autobiographical compositions – explore possibilities to re-examine and share alternative avenues of scholarship and theoretical understanding, not least in redefining what contribution to knowledge that artistic processes and ‘artwork’ makes methodologically, pedagogically, aesthetically, and therapeutically. Our intention is to engage the reader-viewer-listener to (re)think, take notice, disrupt, re-examine and extend personal meanings about return to practice journeys, enabling each of us to benefit and be (re)inspired. We recast aspects of ‘knowing and experience’ metaphorically, to consider and express our sense of being and becoming in the world. Importantly, we seek to explore how arts informed ways of knowing and learning about the self and other can serve to enhance our students/researchers/practitioners learning experiences. In the spirit of bricolage, we provide a graphic road map. We invite the reader/viewer to listen to the music whilst reading the text, or listen to the recorded poems and music whilst looking at the visual images. Shared stories, particularly between three people, are rarely represented in print journals; moreover, no digital social science journals have hosted images, text (prose & autoethnographically composed stories) and music in any shape or form, so we consider this composition to be an “experiment” in form. The nature of the music – British lute music – is intended to provide the ‘glue’ between the written segments. However, the interpretation of the aesthetic dimensions of the images of wood and the essence of the music accompaniments of our piece is intentionally left to the reader. realising that was 13 years ago. (it was always great to see you). Amazing, another year has passed. So I am taking action. on my proverbial OT bicycle ASAP! put a form in the post. and 30 days of updating. The focus of our inquiry is about how the relationships between artist-researcher-practitioner, agency, dialogue, and aesthetic theorising. We draw upon the notion of bricolage that was developed in a/r/tography by Irwin & de Cosson (2004) to explore our phenomenological experiences through the heuristic processes of creativity in poetry, music and images that are renderings of our data. As with any arts-informed or art-based research, the complexities of our renderings, and the contiguity we encounter is a process that unfolds, enfolds and is interwoven through our roles as artist/researcher/teacher (i.e., the a/r/t of a/r/tography). Bricolage is a technique in the visual arts where art works are created with a variety of available and found materials. In music, it includes found sounds and sound made from found objects to compose soundscapes or in some cultures, unique sounding instruments and music (e.g., Trinidadian steel drum music). In the present inquiry, inspired by the notion of ‘returning to practice’ that was a recurring theme in the prose and poetry of Karen and Katherine, Peter searched his vast collection of music and augmented that with library and Internet searches to rediscover music that he’d played in what seemed like ‘another lifetime.’ The bricoleur is a person who constructs or creates their work from a diverse range of things making “use of the tools available to complete a task” (Kincheloe 2001, 60). It can also be interpreted to mean that researchers (who act as bricoleurs) use a collaged variety of common, found and invented tools, analytical frames, and multiple theories and philosophies to undertake inquiries that reach a deeper level of research questions, hybridized methods, data analysis and (re)presentation. Our work in this special edition of the Journal of Media Practice draws on our experiences of adopting an autoethnographic and autobiographical research approach – using poetry, music, and images – drawing on Prendergast et al. (2009) and Furman (2006). We suggest that the sharing of research findings made accessible through the use of art forms can be most powerful in their design to broaden and deepen conversations and raise further questions. Such forms of analysis and interpretation provide possibilities to re-examine and extend meanings about phenomena, providing different, competing and complementary modes of expression, creative thought, and action. As the arts are an expression or application of human creative skill and imagination, a wide range of forms can be considered, such as web-based and digital media, writing, sculpture, theatre, and performance. Our focus in the present composition has been in bringing together poetry, music, and images that have been used for thousands of years as tools to explore and understand the human condition. We use them here to amplify metaphoric relationships. 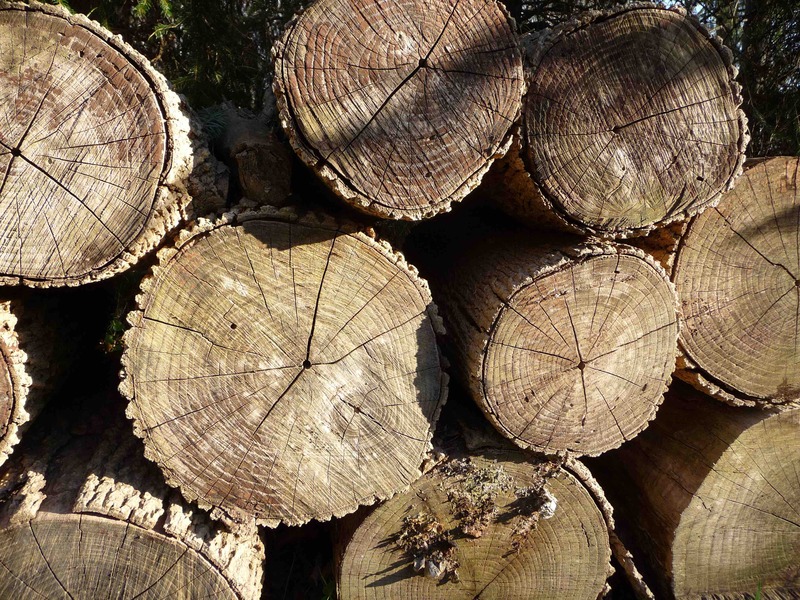 Our choice of images around wood has been carefully selected and considered, representing the many changes wood may undergo through its life course, whilst also connecting to the professional roots of occupational therapy and the arts and crafts movement. Not unlike the ways that viewers in a museum or listeners at a concert react and respond to art, we hope to provoke interpretations and aesthetic responses to our paper because it is not our role to provide explanatory notes to make meaning for the reader. Rather, we invite the reader to bring personal understandings to our inquiry so that the reader may make generalizations to their own practice. Collaboration thrives on diversity of perspectives and on constructive dialogues between individuals negotiating their differences while creating their shared voice and vision. Collaboration includes a diversity of ideas that spring forth from exciting, invigorating, creative dialogues between colleagues to form a bricolage of actions, voices, and visions. Image 3: In de Cosson’s writing (2004) it’s spelled (s)p(l)ace, (as in a ‘living dynamic’ between space and place)- but I edited this image from a photograph I took at a neighborhood construction site “WALTERSPLACE” and it was too difficult to pass up. In arts-based research practices, a series of abstractions and dealing with the abstract is equally as important in learning about the experience. For example, a short story or poem may be used as a way to condense a series of similar observations (Furman 2006). Whilst more traditional qualitative methods seek to explain phenomena and reveal meaning, arts-related research is more interested in understanding how insights are constructed from creative and critical practice (Sullivan, 2006). Meaning making is thus considered in relation to plotting out a course of action as critical, reflective and investigative praxis (Stewart 2008, 124; Gouzouasis and Ryu 2014). 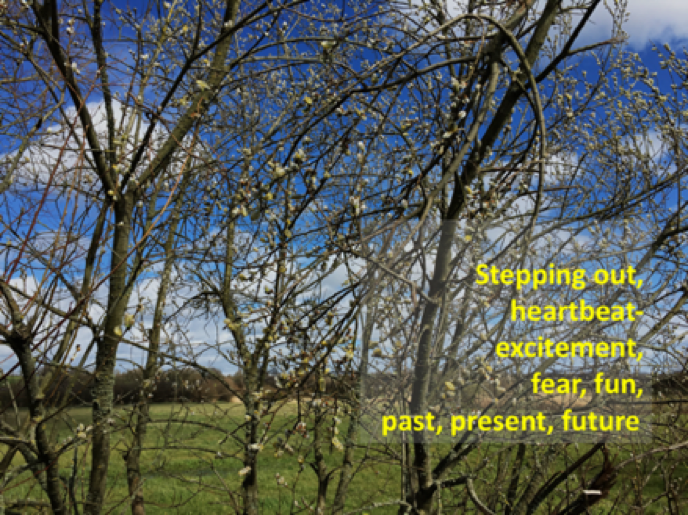 The more questions we unearth from fertile s/p/laces (de Cosson 2004) of inquiry and the more we describe and understand the qualities of our work in new, imaginative ways, the less finite, reckless, fleeting and self-absorbed our work may become. Since the 1980s postmodern, hermeneutic, feminist, post-colonial, and post-structural theorists have claimed that “theory is a story” and demonstrated that not only is the “personal the political, the personal is the grounding for theory” (Richardson 2000, 927). Subjectivity, emotion, feeling, and reflection have been embraced in the research and research writing process (Richardson and St. Pierre 2004). Scholars have been encouraged to show rather than tell (Leggo 2008, 11). That notion resonates with a paraxial approach to the profession of occupational therapy. From an arts-based perspective, it is not merely an issue of using art in occupational therapy (i.e., used as a tool or medium of therapy) or art as a form of occupational therapy; it is a holistic conception of occupational therapist (and occupational therapy) as storyteller – the ‘professional practice connoisseur’ who is able to engage with the art of developing a critical appreciation for their practice through grappling with artful research methods. In that way, a more integrated picture of our experiences and practices can emerge. Katherine suggests, write a 5 line poem every day, reflections. Summer holidays…pleasure/pain…two sides of the same coin. Children: fed up with mother trying to spend meaningful time with them! alongside OT things to do-explore-digest-become. Two sides of my coin, the same coin, a slightly rusty old coin. September – back to work. Katherine writes: “Here’s a link – www.wikihow.com/Write-a-Haiku-Poem. Keep them flowing”. Karen watches: QI (on the tele), about Haiku. Karen wonders: How to Haiku? Wiki how? Wiki wordy. Wiki tricky! Autumn sun – Golden hues. Leaves changing, contorting, falling, flying. Children gather and frolic among this seasonal treasure. April – in partnership, preparing for presentations. Processes – Poetry – Poesis. Prose – Praxis – Portrayal. A/r/tographers ‘live the inquiry’ through artistic processes that are holistically experienced- they relish in the untold stories of the messiness of the research process that often parallels the creative processes” (Prendergast, Gouzouasis, Irwin and Leggo 2009, 312). Thus, the use of art forms such as music, photography and poetry, in arts-informed research, is a purposeful act through which the researcher seeks to engage the reader-viewer-listener to think (again), to take notice, to see afresh, to disrupt; to persuade people to revisit the world from a different direction (Barone and Eisner 2012). The aesthetic form used within the inquiry needs to be able to effectively capture the emotion, energy, themes and ideas which are revealed; to creatively and strategically edit the story (Saldaña 1999); To describe and understand the work through new, imaginative ways which challenge, evoke, provoke and capture our attention whilst creating uncertainty (Gouzouasis 2008a). As the form of a work of art echoes that shape of what needs to be expressed (Langer 1953, 25–26), so does the art form influence the research and the research influence the art form (Gouzouasis 2008b). Thus the aesthetic element of our analysis shared in this paper – bricolage – has involved decisions about musical composition, style, use of image and metaphor, and with this, the researcher’s own relationships to the art forms; “the tangible means that give form to imaginative thought” (Sullivan 2006, 31). 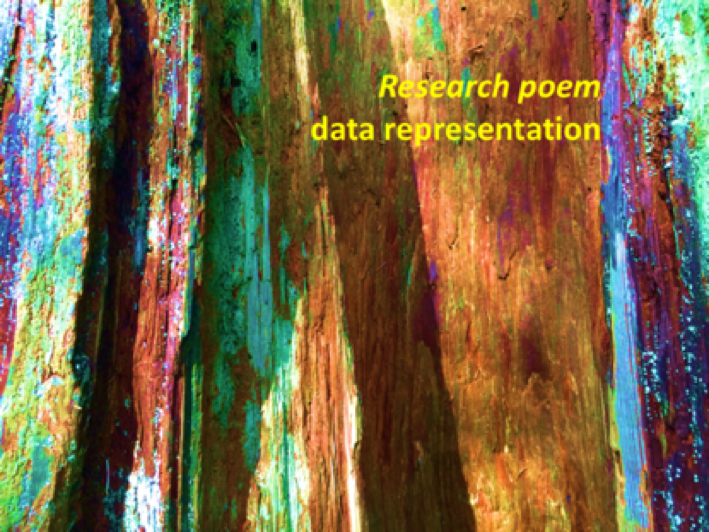 The research poem is a form of data representation, where narratives and text generated in the data collection process of qualitative research are condensed into poetic forms. Poetic form typically refers to using the line breaks visually associated with poetry as a means of emphasis. This emphasis helps increase the evocative nature of data representation by focusing attention on key aspects of data. Research poems are consonant with the notion that we seek to faithfully present participants’ experiences in a way that highlights their essence (Reason 1998; Willis 2002). From a metaphorical perspective, the same connections exist within the power of photographs. 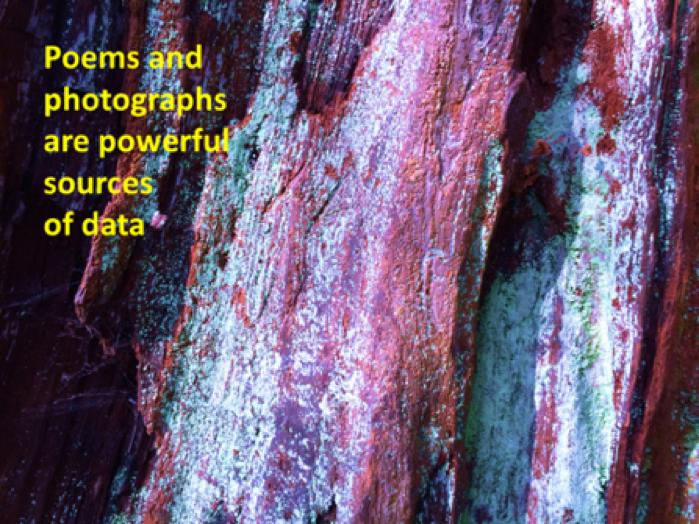 Poems and photographs are powerful sources of data for several reasons. 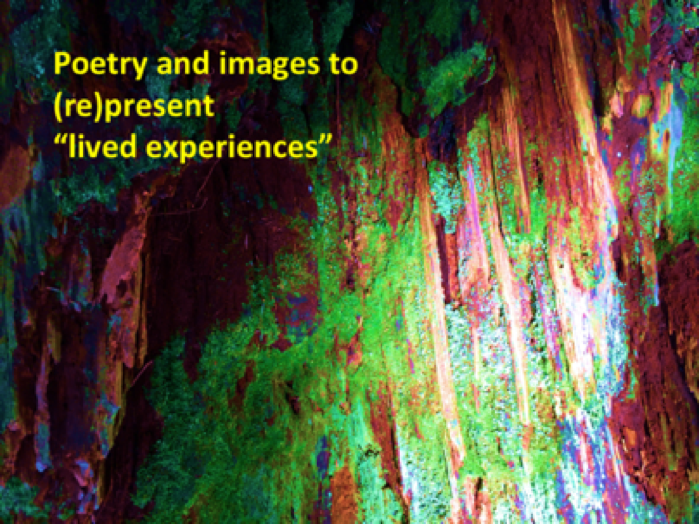 For example, the strengths of poetry and images convey complex and powerful emotions. 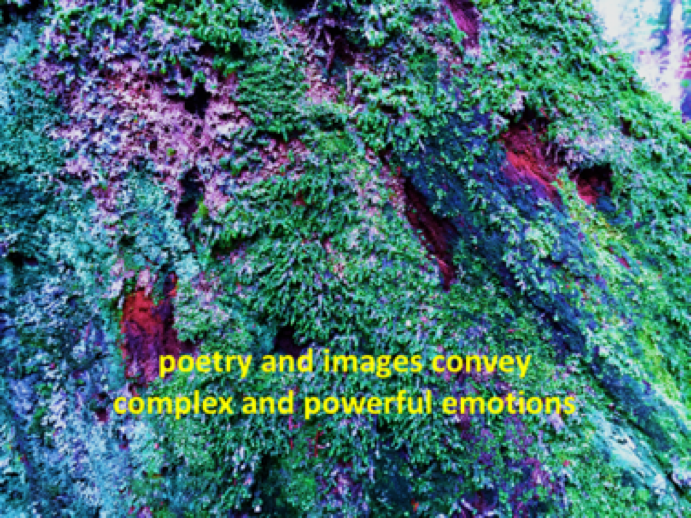 The power of juxtaposing poetic and visual images can help convey conflicting and dialectical emotions that often characterise complex experiences and relationships. Poetic inquiry practices fall under three main categories: autobiographical or auto-ethnographical studies; poetic transcription and representation of participant interviews or other data; and theoretical poetry that addresses various scholarly issues (Prendergast 2006). The present study falls under the first category, that of autobiographical or auto-ethnographical studies, with the use of our own poetry and our own (for the most part) photographs. Over the past 12 months we have been exploring new avenues of scholarship and theoretical understanding, not least in redefining what contribution to knowledge the artistic process and ‘artwork’ makes methodologically, pedagogically and therapeutically. 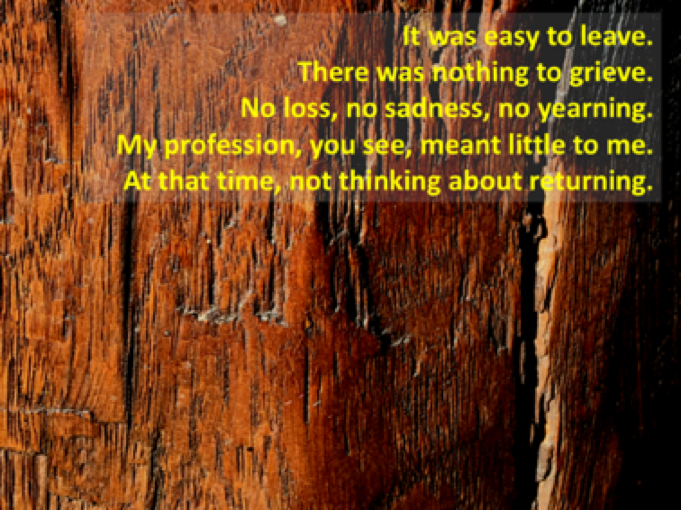 Our stories and poems are based around the experiences of an occupational therapist, Karen, who after a career break to have a family, decided to re-enter her profession. Our work also shares our collaborative research practices, which has enabled each of us all to benefit and be inspired, again. Our aim is bring to life and illuminate our experiences of our journeying as practitioners/artists/researchers/teachers with humour and humility. Katherine: Having worked as an occupational therapist for 10 years in health followed by 10 years as a lecturer and now as a Reader in Education Research and Pedagogy, my interest in arts-related research has arisen from multiple layers of experience, not least through my own creative practice and insights from arts processes that have informed my belief, following Reilly (1962, 87), in how the use of our hands, mind and will can creatively deploy our thinking, feelings, purposes and health. My research practice seeks to draws on the personal with the constructive, to explore difficult, challenging concepts and ideas, being careful not to flatten the complexities of complex situations. I recognise the value of embodied knowing, thinking and imagining, valuing and sensing. For me the creativity of art based education research practice extends opportunity to develop a greater awareness of self and in ‘having a view’. It is about not being cut off from our senses, but to enable a richer sense of engagement in learning, to be aware; to receive, to say, to write, to play. Dewey (1934, 86) wrote about creativity promoting “variability, initiative, innovation, departure from routine, experimentation, the manifestation of genuine nisus in things”. Creativity enables us to engage and experience with curiosity and respect (Sealey and Reason 2008), to embrace ‘moments’ for ‘yet to surface understandings’ to occur. I have been researching how the artistic process in learning (and outwith the arts disciplines) provides a rich and fertile means of looking at learning from alternative directions – learning as improvisation; learning as ‘becoming pedagogical’ (Irwin and Springgay 2008); learning as suspending intellectual sense making, and being open to the richness of our imagination and curiosity. I met Karen on the undergraduate occupational therapy programme and was Karen’s research tutor. After graduating in 2002 and working for eight years as an Occupational Therapist Karen left the profession to take a family career break. Five years later she embarked on her return to practice journey, part of which involved contacting me as a mentor. To cut a long story short we started writing poems distilled from our email conversations and meetings over a 12-month period. I met Peter in Chicago at the American Education Research Association Conference 2015, through the Arts Based Education Research (ABER) Special Interest Group. I was presenting a paper about methodological stance and the analysis and interpretation of ‘data’ when using arts informed / arts related research practices. I had co-authored a book with Maggi Savin-Baden (2014) written to offer guidance to those new to the field to denote what is being done differently. As an experienced Artist/Research/Teacher in ABER, specialising in Music Education, I was keen to collaborate with Peter and was able to invite him to the Disruptive Media Learning Lab (DMLL), at Coventry University, where he generously shared from his artful scholarship and practice. And, as a regular attender of the research seminars on Arts Informed Research that I have been organising in the DMLL, Karen met Peter. 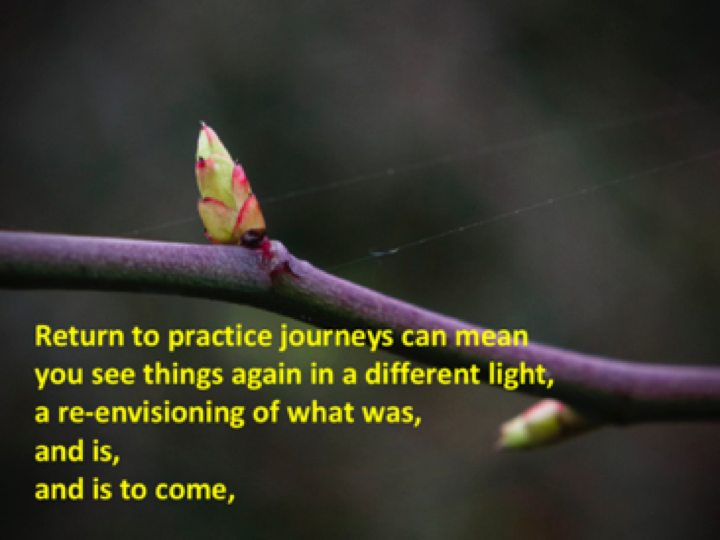 Peter encouraged our poetic journeying, not least through considering how a poetic conversation could describe our stories, our tales (van Mannen 1988), and resonate with other people’s (similar) experiences, both from the outside in and the inside out. Whilst a broad landscape of scholarly practice has emerged that reinstates the author as subject, and embraces creative and storied means of representation, a dearth of literature leaves the return to practice journeys of occupational therapists largely untouched and unexplored. The purpose of our storied and poetic inquiry therefore, seeks to artfully describe the highly subjective social, emotional, spiritual, and heartful aspects of Karen’s return to professional practice. In addition, it has also been a space in which I have explored how to further my own research practice and methodological creativity through connecting with the personal, by being open to feeling vulnerable, of being aware, of experiencing writing as creativity, and sharing research practices through different ways of knowing. As Ron Pelias (2004, 1) asserts, there is more to making a critical case, more than establishing criteria and authority, more to presenting research findings when we connect from the heart, the body, and the spirit. That’s me in the spotlight losing my religion. Reflecting: Nearing the end of my degree I was well rooted in the rich compost of theory provided by Coventry University. I had grown a few shoots as an occupational therapist; placements over the course of my training had fertilised the seeds planted in the paperwork, books and lectures at the university (we weren’t so digitalised or disrupted back then!). Success as a student had given me confidence and complacence that I would flourish in the field. In professional practice there was sunshine, rain, photosynthesising, branching, blossoming and fruiting as a therapist. Then a time in my career with little nourishment, limited growth, dormant. And increasingly alongside this there was a new nature, that of nurture; having children which became a reality for me and eventually prompting me to leave occupational therapy for occupational motherhood (losing my religion or perhaps changing churches). You will see how the story unfolds. Returning: When the time came to return to practice (or re-establishing my religion or faith), for me this also meant returning to Coventry University, returning to Katherine and later, an introduction to the work of Peter and then meeting him during his visit to Coventry in 2016. My connections with Katherine and Peter as part of my return to practice have been invigorating. Katherine’s suggestions have pushed me in new directions and enabled a reconnection with occupation and the arts as a tool for creativity, expression, performance and learning. The beauty in Peter’s paper ‘A pedagogical tale from the piano studio: autoethnography in early childhood music education research’ (Gouzouasis and Ryu 2014), illustrating many ideas around practise and practice, had such resonance for me as a parent and as a therapist. That, and his advice to always carry a memory stick … priceless! The College of Occupational Therapists (2016) define occupation as “… practical and purposeful activities that allow people to live independently and have a sense of identity.” Many Occupational Therapists further conceptualise this understanding through the Model of Human Occupation (2016) which seeks to explain how occupation is motivated (volition), patterned (habituation) and performed (mind/brain/body). These interrelated components are supported or inhibited by the physical and social environment. As individuals, Katherine, Peter and I came to this piece of work with our own volition, habituation and performance, practices, paradigms and personal perspectives. Together we have created conditions or an environment which has enabled and influenced our creativity, our individual and collective practice; together and individually remembering, reflecting, returning in multiple ways and with multiple meanings, enhancing and altering our sense of identity, our occupations, ourselves. It is about being present in the moment, drawing on experience and engaging aesthetically with meaning, self and other. The Latin root of currere refers to running a course, or making one’s course. In his seminal essay on currere (1975), William Pinar’s acknowledgment of the self and our existential experiences as the source of ‘data’ was a quantum leap in understanding the role and relationship of the researcher to that which is researched. Pinar adopts the role of artist (i.e., as creative writer of biography) and the epistemological stance of a phenomenologist in attempting to place and define the role of the Self (the auto) through a trans-conceptual, trans-temporal lens. By default, his study of that which appears to make sense (i.e., the phenomenon, or phainomeno; φαινόμενo) seems to be a non-linear stance – the person is able to recognize and identify the past and present, in relation to what the self can imagine to be the future (both that which is immediate and that which is to follow). However, in recognizing the I and those – and the notion that there are relationships that we can recognize between the personal and professional, the personal perspective, and one’s educational experience – Pinar sought to realize multidimensional perspectives. First and foremost, by acknowledging the Self, I, those, and other he was on the advance edge of knowing and foreseeing the auto (the αυτό, pronounced afto, means much more than self) in all its intended, expanded splendor – self, him, her, this, that, those, they (see Gouzouasis and Ryu 2014; Gouzouasis and Leggo 2016) – and how it relates to biography, notably autobiography (a term that does not appear in Bill’s 1975 AERA paper), autoethnography (a term that does not appear in social research for at least 15 years after Pinar’s seminal paper), and how it may be expressed as a form of arts-based educational research (a term that does not appear in educational research until 1997 in Barone and Eisner’s classic handbook chapter). In whatever way we may be conscious of the world as universal horizon, as coherent universe of existing objects, we, each … and all of us together, belong to the world as living with one another in the world; and the world is our world, valid for our consciousness as existing precisely through this ‘living together.’ We, as living in wakeful world-consciousness, are constantly active on the basis of our passive having of the world … Obviously this is true not only for me, the individual ego; rather we, in living together, have the world pre-given in this together, belong, the world as world for all, pre-given with this ontic meaning … The we-subjectivity … [is] constantly functioning. In March 1994 I tore the tendon in my right-hand ring finger. A freak accident, I grabbed my then nine-month-old Brittany spaniel by the collar as he was running into the road at Locarno Beach out by UBC’s campus. Skye, who was full of piss and vinegar, ran in one direction, my finger snapped and went another direction. The thirty-minute drive home to North Vancouver, I was crying in pain and anguish. When I finally made it to the emergency room, the attending doctor approached me with a worried look. Something was wrong – one should never be able to touch the palm with the tip of the middle finger without moving the ring finger. But it didn’t even twitch. “Now touch your baby finger to your palm,” he requested. It was then that I realized it was very serious – I could touch my palm with my pinky, yet my ring finger stood perfectly still. A plastic surgeon was called to the emergency room, and he put me through the same, simple test and explained the bad news. The surgery that evening to re-place the tendon and the small bone at the tip of my ring finger was successful, but it left me with no feeling in my fingertip and with little flexibility in the upper finger joint necessary to perform music I’d played for over 25 years. The fingertip was sewn on slightly crooked and a week after the operation, the surgeon didn’t think it was necessary to go to physiotherapy to try to gain more flexibility and straighten the finger joint. Three months after surgery, I learned about the Hand Clinic at Vancouver General Hospital, had a number of hot wax treatments and physiotherapy, but by then it was too late. Thus ended tens of thousands of hours of ‘practice,’ and my life with the classical guitar. I didn’t touch a guitar again until August 1997, six weeks after I was released from a lengthy stay in the hospital after a re-sectioning of my descending colon. It was during that time in Lion’s Gate, staring at a dozen stainless steel staples from my upper stomach to lower abdomen that I had an epiphany about playing again. The day after I left the hospital I was walking down the local avenue, just happy to be alive and out for a leisurely stroll with my three year old son, when I passed a music store, and there she was – a 1980 Ibanez Joe Pass jazz guitar. It was as if the epiphany called that particular guitar into existence. I went into the store, played it for five minutes, put a $50 deposit on the instrument, went to a nearby bank and withdrew the cash, and within 30 minutes had a new friend for life. I went about resuscitating my jazz guitar skills, using a plectrum, and within a month recruited fairly advanced students to challenge me in regaining ‘my chops.’ The past seven years have been particularly musically enriching, bringing me to the (s)p(l)ace (de Cosson, 2004) in which I write the present musings and share the recordings that accompany the poetry in the present paper. Since the presentation of the present paper at AERA, and my musings during the summer as to how I could write alongside Karen and Katherine in more than merely a theoretical manner, the present ideas have emerged through my research on the selected music, the selection of the music, my playing the music, the recording process of the music, and my ideas on how the music could be used in a 21st century online journal. In the 1970s and early 1980s, I was inspired to do a number of transcriptions of English lute music and French Baroque guitar music. The first manuscript I was able to secure (in 1974) was a microfilm photocopy of Jane Pickering’s Lute Book (1616; British Library MS Eg. 2046) from UMI (NB: UMI is now a dissertation clearing house but once made other old books available to academics on microfilm). The Temple University Library also had a number of large scale, manuscript collections of lute music and lute songs by John Dowland, Francis Cutting, Francis Pilkington, Anthony Holborne, John Bartlet, anonymous compositions published by Pierre Attaingnant, and early four string guitar music composed and published by Adrian Le Roy and Robert Ballard (1551). 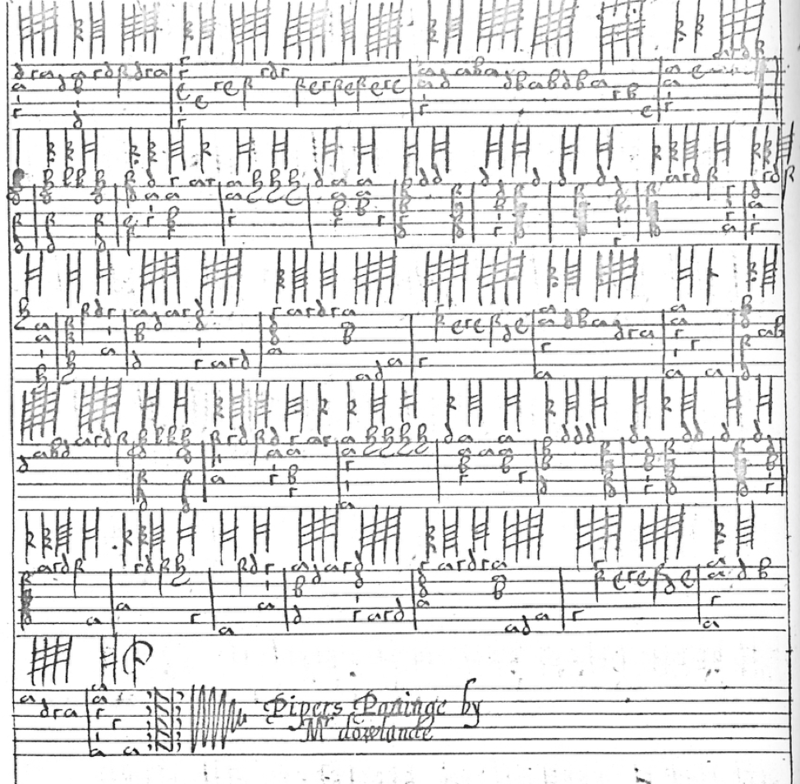 Attaingnant was best known for popularizing a single impression technique for music printing that revolutionized the distribution of music in the 1500s. One may think of that publishing innovation as important a technological development as CDs was to LPs. While I played lute for a period of time on a borrowed instrument, my main interest was in transcribing lute tablature into standard music notation, which I’d learned to do from Peter Segal, my classical guitar teacher in undergraduate school. In Barley’s notes “To the reader” he confidently proclaims, “Authors that hath professed the practise of those instruments only for the ease and furtherance of such are as desirous to have a taste of this sweet and commendable practise of music, and for the more ready attaining thereunto, is added sundry necessary rules, plainly teaching how thou must accord or tune these instruments by art or by ear, and the disposing of the hand in handling the neck or belly of the lute and other instruments.” Therein, the word practice (North American spelling and italics mine) appears twice, first as a way of doing something, and second as the exercise of a profession. So, as mentioned at the start of our piece, Katherine and I got back in touch after having seen one another at the 25th year anniversary event of the Occupational Therapy programme at Coventry University. (A ‘galliard’, also spelt ‘gaillarde’ was a dance – and music – performed all over Europe in the 16th century and was the favourite dance of Queen Elizabeth I, see Brissenden, ‘Shakespeare and the dance, 1981’. The recording above is provided for the reader to listen and recite the poetry; the recording below is a version read by Karen with the same music accompaniment). 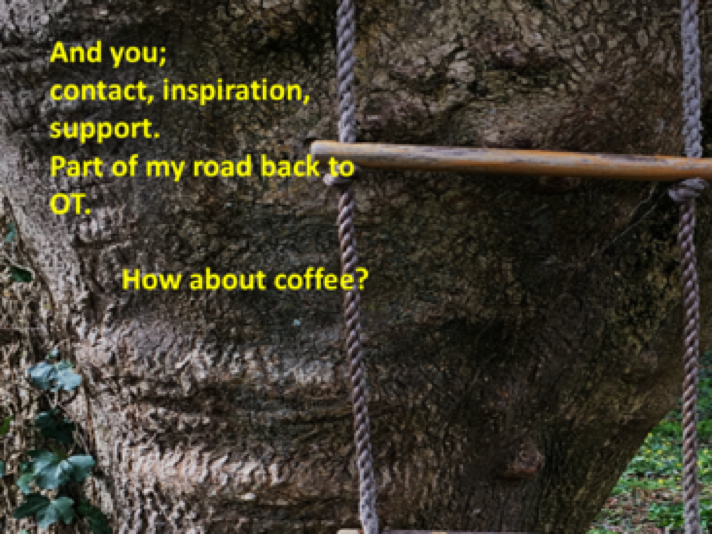 And you – contact, inspiration, support? Part of my road back to OT? Inspiration, a part time job at the university?! I hope, I joke, I look forward. It was time to return! I was excited, enthusiastic! And in a flurry of spring time activity we met up, we corresponded and our relationship which is now established as one of Mentor/Mentee was pivotal at that stage of my career, returning, as it was all those years ago as an undergraduate. Writing poems invited us to be more open to explore our worlds and the possibilities of creative research practice and ways of knowing; Of seeing learning as inter-disciplinary, interdependence, embodying vitality, dwelling upon possibility, being attuned, being exposed and creating uncertainty – all of which gives rise to creative thought. Writing poems has been reflective, exploratory, helping me to make sense of feelings, actions and situations on my journey. Rich Furman, in his (2006) paper on ‘Poetic Forms and Structures in Qualitative Health Research’ describes his goals for writing a poem as threefold: (a) to represent faithfully the salient affective and psychosocial issues, (b) to create and aesthetically satisfying poem, and (c) as a means of self-exploration and even self-therapy. (Furman 2006, 562). These goals have made sense for me in my writing. This week, I finished my job at the Children’s Centre. Where my kids went to nursery, we did baby massage, singing groups together. Where I got my ‘fitting in with family life’ job. This week, moving forward as an OT. This week . . . poignant, strange, positive. Autoethnographic data are a valuable methodology for explaining lived experience of intense human events. Such methods focus on authenticity, empathy and a willingness to be open and vulnerable. Having updated and returned to the profession in 2015, Karen reflected on how different things seemed now in 2016. So much more engaged, enjoying the work, the role, the balance between job and home. How she had loved this profession so dearly and fallen out of love with it so easily. There was nothing to grieve. No loss, no sadness, no yearning. required more than a plaster or suture. Time out was needed, to tend saplings I’d seeded. OT could be resumed in the future. So it was easy to leave. It was much harder to return. In a flash, 5 years passed. A void, a vacuum created. a fresh OT seed germinated. and into the heat of the fire! Flaming hoops – unanticipated, red tape – negotiated. But undeterred, OT her desire. (‘Toy’ – version 1 – is a lute solo, also likely written by Dowland). …all this very familiar for me, as well as the sense of having sound clinical experience to draw on mixed with feeling like a new graduate, a complex juxtaposition! Harrington (2015, 215) stated, “What is important is I have fallen in love with the profession all over again,” and this is also true for me. (‘Loth to depart’ is another song set for lute during the Elizabethan period). But I have stalled a bit. Home has been busy, chicken pox, half term. In the opportunities we discussed. Barnett (2010) discusses the importance of education contributing to the enhancement of ‘lifewide learning’ to engage us as thinking, acting persons. Through reflection and immersion in these creative (s)p(l)aces, I have had chance to look again at ways to explore the disconnect one can experience in work and life, as we strive to move forward. a re-envisioning of what was, and is, and is to come. Resuming the practice through praxis. (This second setting of ‘Bonnie Sweet Robin’ is in AAB form). I do know how to ride a bike. I learnt when I was a child. not been ridden for a while. I worked hard to master this bicycle. Three years for me to learn. 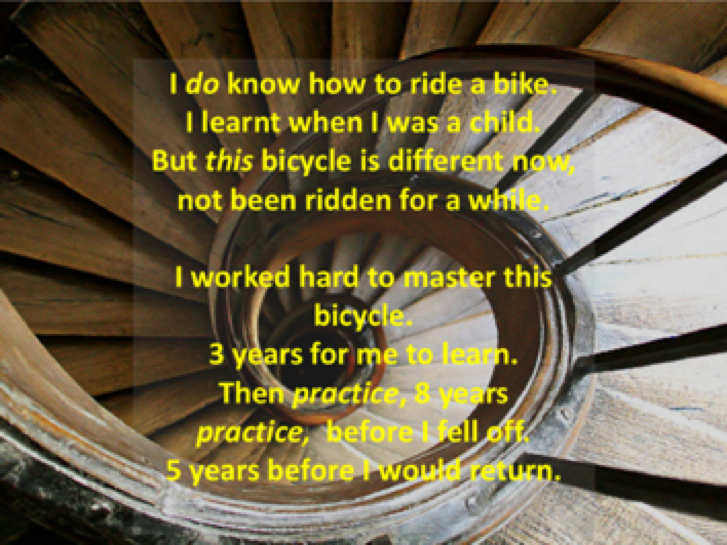 Then practise, 8 years practice, before I fell off. But this isn’t a sad story, there’s a happy ending and time out has been a good thing. I’m glad I left because returning has been such fun! I am invigorated and enlivened and enjoying my day to day work as an OT as well as developing my new Coventry connections. Occupational Therapist; with experience, also learner. Volition – Habituation – Performance – Environment = Returner. before I let it get dusty. But any thing (or one) can be recycled. just requiring revision and new knowledge. down new and familiar paths – journeying. Returning to roots, exploring new routes. 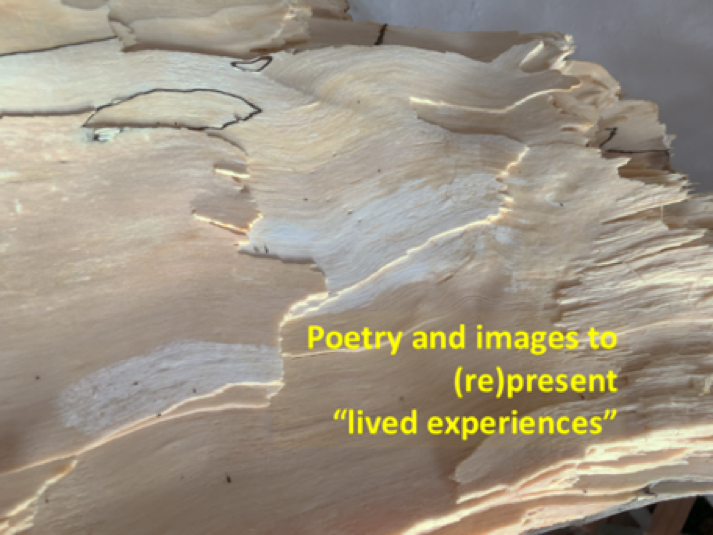 What I have also been interested in, as we have continued our work together, is the application of arts informed methodology as pedagogy – as applied practice based methodology – and how our use of poetry, music and images might be used as a conduit for reflection. For example, to explore students’ presentational knowing; their tacit, experiential and practical knowing, encompassing intuition and reflection, imagination and conceptual thinking (Heron 1992). We have been exploring how ‘knowing’ can be symbolized and represented in different ways as a means to help one consciously explore the ‘self’. In fact, Karen presented her poems at the National Association of Educators in Practice Conference 2016, at Coventry University, and was approached by a paramedic afterwards who shared how moved he had been by her work. As a lecturer often left worrying about how his students were coping whilst on their work-based placements, he could see how a poetic approach to sharing that which is often unspoken, being a valuable means for his students to share their felt responses towards the challenge and unpredictability they encountered out in the field. The power of the arts, juxtaposing with therapy, occupation, education. Education is often focused on propositional knowing; explicit knowing about the discipline shared and discussed through theory, principles, procedures, facts and research. We are interested in accessing students/researchers/practitioners first person narratives and recasting aspects of such ‘knowing and experience’ into ‘forms’ with potential for challenging and exploring such forms and how they reveal personally held beliefs and values (Barone 2001), including how those aspects of knowing about the self may change and shift as learning may be metaphorically considered a progression much like the harmony of a music composition. We want to explore – with students/researchers/practitioners – our willingness and ability to be open to experiencing the world in our methodological and pedagogical practices, to explore and express our sense of being and becoming in the world; to develop a greater awareness of self in the world; to receive, to understand, to make, to write – to be consciously acquainted. Importantly, we are interested in knowing how exploring these aspects of knowing and learning about the self can enhance our – students/researchers/practitioners – learning experiences. We have explored arts-related research as a rich, creative, exciting, yet complex field of inquiry that has much to offer educational researchers. We suggest that the sharing of research findings that are made more accessible through art forms, and practices, with educator-therapist-participants can be most powerful in its design to broaden and deepen conversations and raise further questions. Such forms of analysis and interpretation provide possibilities to re-examine and extend meanings about phenomena, providing different, competing and complementary modes of expression, interpretation, creative thought and action. As we consider the aesthetic dimensions of writing Arts-Informed/ Arts Related Research (Savin-Baden and Wimpenny 2014) we are reminded of Eisner’s notion (Barone and Eisner 1997) that the art form must inform the research and the research inform the art form to create tensility and verisimilitude for both the writers and readers of this form of inquiry (Gouzouasis 2008b, 225-226). As with any artistic form – sculpture, painting, photography, music, dance, poetry, drama – the artist may start with a plan to compose their new work, however, the creative journey is a process. The form, or shape, of our essay emerged in the crucible of our imaginations and we embraced the bricolage that emerged through the process. In that sense our essay features an improvisational sensibility, and like most improvisations in music, there is always a form – whether it be a chord progression or formal structure – that is not necessarily clear to the audience on the first listening. Even the most abstract music, or paintings, posses an intrinsic form that begs to be discovered through individual analysis and interpretation. It is with these notions in mind that we invite the reader to reconsider the conceptual and heartful dimensions of our work. Barnett, R. 2010. Lifewide education: A new and Transformative concept for higher education? In N. J. Jackson and R. K. Law, eds, Enabling a more complete Education: Encouraging, recognising and valuing Lifewide Learning in Higher Education, 23-35. On-line at http:/lifewidelearningconference.pbworks.com/E-proceedings. [Accessed Nov 28 2016] . Barone, T., and Eisner, E.W. 2012. Arts based research. London: Sage. Barone, T., and Eisner, E. 1997. Arts based educational research. In R.M. Jaeger, ed. Complementary methods for research in education, 73-103. Washington, DC: American Educational Research Association. Bartlet, J. 1967. A booke of ayres: 1606, edited by D. Greer. Menston, England: The Scholar Press Limited. de Cosson, A.F. 2004. The hermeneutic dialogue: Finding patterns amid the aporia of the Artist/Reseacher/Teacher. In R. L. Irwin and A. de Cosson, eds, A/r/tography: rendering self through arts-based living inquiry, 27-38. Vancouver, BC: Pacific Educational Press. Dewey, J. 1934. Art as Experience. New York: Caprocorn Books. Furman, R. 2006. Poetic forms and structures in qualitative health research. Qualitative Health Research, 16(4): 560-566. Gouzouasis, P. 2008a. Music research in an a/r/tographic tonality. Journal of the Canadian Association for Curriculum Studies, 5 (2): 33-58. Gouzouasis, P. 2008b. Toccata on assessment, validity & interpretation. In S. Springgay, R. L. Irwin, C. Leggo and P. Gouzouasis, eds, Being with A/r/tography, 221 – 232. Sense Publishers: Rotterdam. Gouzouasis, P. 2006. A/r/t/ography in music research: A reunification of musician, researcher, and teacher. The Arts and Learning Research Journal, 22 (1): 23-42. Gouzouasis, P., and Leggo, C. (2016). Performative research in music and poetry: A pedagogy of listening. In P. Burnard, L. Mackinlay & K. Powell (Eds. ), The Routledge International Handbook of Intercultural Arts Research, 454-466. Oxfordshire, UK: Taylor and Francis/Routledge. Harrington, J. 2015. From ‘newbie’ to ‘me’ again. Occupational Therapy News, 23 (4): 25. Heron, J. 1992. Feeling and Personhood, Sage: London. Husserl, E. 1970. The crisis of the European sciences and transcendental phenomenology. Evanston, IL: Northwestern University Press. Irwin, R.L., and de Cosson, A. eds. 2004. A/r/tography: Rendering self through arts-based living inquiry. Vancouver, BC: Pacific Education Press. Irwin, R. L., and Springgay, S. 2008. A/r/tography as practice-based research. In S. Springgay, R. L. Irwin, C. Leggo and P. Gouzouasis, eds. Being with A/r/tography. Rotterdam, The Netherlands: Sense Publishers. John-Steiner, V. 2000. Creative collaboration. New York, NY: Oxford University Press. Kincheloe, J. L. 2001. Describing the bricolage: Conceptualizing a new rigor in qualitative research. Qualitative Inquiry, 7 (6): 679-692. Langer, S. 1953. Feeling and form: A theory of art. London: Routledge and Keegan Paul. Leggo, C. 2008. Narrative inquiry: Attending to the art of discourse. Language and Literacy, 10 (1): 21. Pelias, R. 2004. A methodology of the heart: evoking academic and daily life. Oxford; Altamira Press. Pinar, W. 1980. Life history and educational experience. The Journal of Curriculum Theorizing, 2 (2): 159-211. Pinar, W. 1975. Currere: Toward reconceptualization. In W. Pinar, ed, Curriculum theorizing: The reconceptualists, 15-424. Berkeley: McCutchan. Pinar, W. 1975. The search for method. In W. Pinar, ed, Curriculum theorizing: The reconceptualists, 396-414. Berkeley: McCutchan. Prendergast, M. 2006. Found poetry as literature review: Research poems on audience and performance. Qualitative Inquiry, 12 (2), 369-388. Prendergast, M., Gouzouasis, P., Leggo, C., and Irwin, R. 2009. A Haiku suite: The importance of music making in the lives of secondary students. Music Education Research, 11 (3): 303-317. Reason, P. 1988. Human inquiry in action: Developments in new paradigm research. London: Sage. Reilly, M. 1962. Eleanor Clarke Slagle Lecture: Occupational therapy can be one of the greatest ideas of 20th century medicine, American Journal of Occupational Therapy, 16, 1 – 9. Richardson, L. 2000. Skirting a pleated text: de-disciplining an academic life. In E. A. St. Pierre and W. S. Pillow, eds, Working the ruins: feminist poststructural theory and methods in education, 153-163. New York, NY; London: Routledge. Richardson, L. and St. Pierre, E.L. 2004. Writing: a method of inquiry. In N. Denzin and Y. Lincoln, eds. Handbook of Qualitative Research, 959 – 978, Thousand Oaks, CA: Sage. Saldaña, J. 1999. Playwriting with data: Ethnographic performance texts. Youth Theatre Journal, 13, 60-71. Savin-Baden, M., and Wimpenny, K. 2014. A practical guide to arts-related research. Rotterdam: SENSE Publishers. Sealey, C., and Reason, P. 2008. Expressions of energy: An epistemology of presentational knowing. In P. Liamputtong and J. Rumbold, eds, Knowing differently: Arts-based and collaborative research, 1-22. Hauppauge, NY: Nova Science Publishers. Sinner, A., Leggo, C., Irwin, R., Gouzouasis, P. and Grauer, K. 2007. Arts-based educational research dissertations: Reviewing the practices of new scholars. The Canadian Journal of Education 29 (4): 1223-1270. Stewart, R. 2008. Creating new stories for praxis: Navigations, narrations, neonarratives, In E. Barrett and B. Bolt, eds. Practice as Research: A Guide, 123 – 134. London/New York: I.B Tauris. Sullivan, G. 2006. Research Acts in Practice, Studies in Art Education, 48 (1) :19 – 35.
van Maanen, J. 1988. Tales of the field: on writing ethnography. Chicago: University of Chicago Press. Willis, P. 2002. Poetry and poetics in phenomenological research. Indo-Pacific Journal of Phenomenology, 3 (1): 1-19. To extend a music metaphor, this coincides with the concept of audiation. Audiation is the ability to conceptualize music sounds without the sounds being physically present. It is the ability to conceptualize and compare the immediate past in music listening with the present and to connect that which has been heard and that which we are hearing with our expectations of what we are about to hear (see Gouzouasis, 1992). For example, if I sing the first pitch (and word) of the children’s song ‘Old MacDonald’ and invite the reader to audiate the reminder of the first phrase and then sing the final pitch of the first phrase, the reader is audiating the entire phrase. I can then ask the reader to sing the next phrase without the cue of a starting pitch and they would be able to predict the precise sound of that phrase based on the melodic material you already audiated. Unfortunately, not everyone audiates the same way, and that contributes to understanding why some people are not able to sing in tune, with or without melodic support or accompaniment.